Celebrating its 20th year, the 2015 Epcot International Food & Wine Festival will be held from . Your Epcot admission is all that's needed to participate in this popular event! The Festival Welcome Center features a Wine Shop where you can purchase your favorite selection as well as other event souvenirs. There are featuring food, wine and beer. The appetizer-sized portions usually range in price from $4.00 - $8.00 (drinks range from $3-$6) and provide the perfect opportunity to try the traditional cuisine from around the world. Many items are available for a Snack Credit on the Disney Dining Plan. 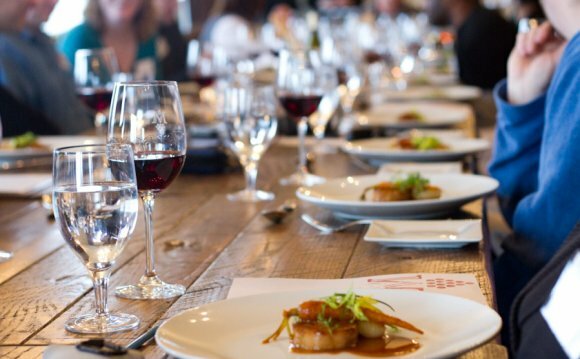 The International Food and Wine Festival will play host to seminars, tasting events and sumptuous dinners overseen by top Disney Chefs as well as renowned guest Chefs. The special dining events can be booked by calling 1-407-WDW-FEST. All bookings are non-transferable and non-refundable. The event is once again sponsored by Chase, who offers the Disney Premier Visa Credit Card, Disney Rewards Visa Card and Disney Visa Debit Card. Cardholders will have access to the Chase Lounge at the Festival, located on the third floor of the American Pavilion. Complimentary beverages will be served and electronic charging stations will be available, as well as a dedicated Festival Information desk, social media photo booth and a computer station for guests to email Festival recipes. The lounge will also host animation sketch classes and caricature artists. The lounge will be open daily from 11:00am - park closing. Just present your Disney Visa Card to gain access to the Lounge. 20th Festival Tasting Sampler - Guests will get a credential and a collectible pin that will allow you to have your choice of eight tastes of food or beverages from the marketplaces, plus priority seating at the Eat to the Beat Concert. The credential will also include ideas for pairing a food and drink from the marketplaces. Cost is $59. Food & Wine Premium Package - Get VIP treatment from noon-8pm on Monday through Thursday at the Festival. Package includes the use of 11 shaded "Premium Package" areas to relax, eat and drink; admission to an IllumiNations Sparkling Dessert Party; and admission to a Festival Center culinary demo or beverage seminar. The package also comes with a gift bag with a wine glass, a bottle of 20th celebration festival wine, a Food & Wine Fest-themed MagicBand and four food tickets for the marketplaces. Cost is 9, call 407-939-3378 for reservations. ABC show "The Chew" will be taping live from the Festival on October 7, 8 and 9! Hosts Mario Batali, Michael Symon, Clinton Kelly, Carla Hall and Daphne Oz will be on hand to tape the episodes that will air October 12-16. For information on how to get tickets for the live studio audience, visit thechew.com. Favorite chefs will be returning - Cat Cora, Jamie Deen, John Ash, Robert Irvine and Buddy Valastro, among others. New dishes coming to the marketplaces - Pepper Bacon Mac 'n Cheese at Farm Fresh Marketplace, Seared Venison Loin in New Zealand, and many more! Party for the Senses is returning every Saturday with more than 50 wines and beers, plus a variety of foods to sample. Also returning are the Ocean Spray cranberry bog and the Chase Lounge in the American Adventure. New this year is Remy's Ratatouille Hide & Squeak scavenger hunt. Kids can search for little Remy statuettes with maps, stickers and prizes. New premium events include "French Family Meal Traditions" lunches on Fridays and Saturdays, a "Rockin' Burger Block Party, " and new beverage events like "Exploring Wines from 1996 to Now." The Ocean Spray cranberry bog is set to return. This was absent in 2014, so its return will be a welcome addition. **All celebrity guests, events and dinners are subject to change without notice. Tip: Purchase a Food & Wine Festival gift card to pay your way around the World Showcase. It's much easier than trying to dig for cash or credit cards as you go from location to location.